Make your vote count for something! Here’s a way in which you can make your vote count for something, regardless of who you vote for and regardless of which candidate wins. 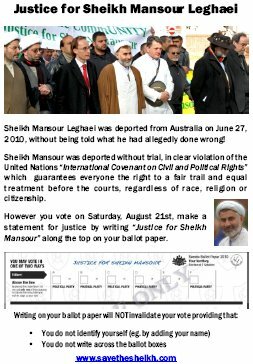 Write the words, “Justice for Sheikh Mansour” across the top of your ballot. Writing on your ballot paper will NOT invalidate your vote unless you either write across the ballot boxes or add your name. Avoid these mistakes and you can validly vote for whoever you like while still making a stand for justice. The scrutineers will read your statement and report back. Full instructions are on the campaign poster, which you see thumbnailed above-left. Click here or the pic to open the full-size poster. Then print off multiple copies and stick them up all over the place. Alternatively, if you’d like a smaller A5 flyer to give out to all your friends, you can grab it here. Please get behind this campaign and make your vote count for something!